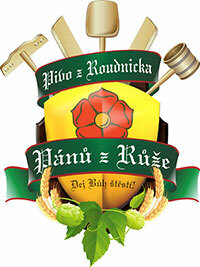 Pánů z Růže Brewery (Lords of the Rose). We mainly make classic Czech lagers and, to a lesser extent, top fermented beers and specials. An interesting note is the larger amounts of weaker beers produced, specifically the light draft (7% of the orig. extract) and the Roudnice 10°. Bulf Lager – a typical light pilsner type lager, 10° Roudnice, Pale draft of Roudnice, Alexander IPA, Jindřich light lager, Vítek premium, Hraběnka special beer with honey, and others. We continuously produce eight brands of beer as well as seasonal specials. Right here in the brewery. Restaurants and other tasting options are published on the brewery's website and Facebook. Any time by telephone arrangement; events also take place in the brewery pub, in winter for 30 and in the summer for up to 80 people. We regularly take our tent and attend events such as Zažít Roudnici jinak and Neckyáda v Židovicích, as well as various events and fairs. Last but not least, we’ve got our own outdoor rock concert event.